Choosing Perfect Wine Related Gifts For The Wine-Lovers on Your List! 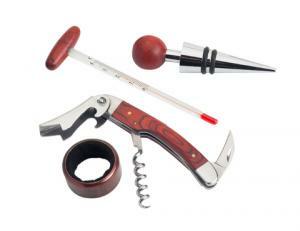 You already know that are a huge number of wine related gifts and wine accessories available. Now you just have to find one that the wine lover on your list will adore. In addition to corkscrews and bottles of wine a favorite wine, why not check out a few of the more unusual products that are too tempting for you to resist. Here is a list of some wine related gifts that are both fun and affordable. For your environmentally aware friends you can gift them with a unique present that they will be happy to use. Choose a wine bottle shaped cheese board made from recycled wine bottles. These are handcrafted, long-lasting gifts that you can personalize with a favorite wine label. For less than $20 you can select salt and pepper shakers that are miniaturized versions of full-size wine bottles. These table accessories are topped with small corks. If your friend is a fan of GrGrich Hills, Cacaphony, or Season’s Vineyards, you can select one of those winery labels to add a more distinctive touch. For a friend who enjoys wine, and approaches it with a less serious attitude, you might want to get them one of the screen-printed Tees with a humorous saying. Perhaps one with that announces, "Conserve Water, Drink Wine" or a T-shirt that announces, "Wine Counts as a Serving of Fruit”. You can find these shirts for about $15-$20. Wine charms for glasses and bottle are available in so many unusual themes that it makes it easy to select a set that perfectly suits any recipient. Choose from a wide variety of styles and materials including charms made from hand blown glass, sterling silver, platinum, beads or copper. These wine-related gifts are often priced under $10. Giclee art prints with glasses, or bottles, of wine as the subject matter can make great gifts. They can be hung on the wall or displayed on a shelf. These pictures are modern works of art that captivate the eye of the viewer. 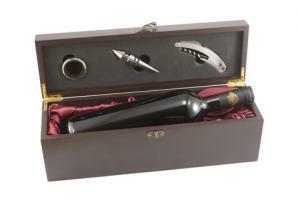 For less than $35 you can select the Le Cruset Trilogy Pocket Model Corkscrew for those wine lovers on your gift list. With this handy utensil jammed corks become history. The corkscrew stand doubles as a foil cutter. Of course, there are many styles of wine bottle openers, so you are sure to find the perfect one for the person on your list. Wine related gifts should all be as practical as Cork Pops' Electronic Wine Thermometer. This is an easy to use accessory that makes sure the wine is always at the correct temperature before being served. There are 4 separate settings that tailor the thermometer readings for the type of wine you are using. The settings are individualized for red wine, light red wine, white wine and champagne. No more guessing about temperature, now you know! The list of wine related gifts include wall plaques, coasters, personalized wine glasses, decanters and cookbooks. You might even want to consider purchasing a wine and cheese gift basket, a subscription to a wine and food magazine or a membership to a wine club. And of course, bottles of wine are always welcome. Check out our wine recommendations for great selections. If it is too difficult for you to narrow the field of possibilities, pour yourself a glass of wine, that should help you get inspired. Useful Accessories For Any Wine Lover! So Many Fun Wine Related Gifts!